Gaze across the City with a tourist's eye and there will be your hills and streets of quaint old houses; cable cars and derelicts and steaming crabs. . . tall buildings underway and vacant lots awaiting enterprise. But view it as a resident and a different landscape manifests; a grid of property and ambition, change and resistance. In a city where low-income is defined for housing purposes as below $28,000 yearly, the overlay takes on a sinister aspect; a shadow of existent and potential menace to the hearth and home. It is, in fact, a board. . . a Mephistopoly similar, in some aspects to the Monopoly board in its gradations between slum and palace, its railroads, bank and jail. But it is no game, or, if it is, it has been entered by new factors: sly attorneys, managers who may either improve or burn their properties, financiers and foreigners and government all transacting business in a weblike skein of conduits running through, beneath and over streets and boulevards like a malevolent electricity; invisible, influential, deadly. . . unaccountable to space or time. And the game is played by different rules and customs. Only the most vainglorious of players ever try to run their rivals into bankruptcy, and only the most ignobly ignorant cases come to grief (and how often are these creatures one and the same?). A game where the only losers are the tenants and the taxpayers who are no sooner disposed of than replaced as the gullible crowd in, deluded by the image of the tourist's San Francisco. And as these discover twenty percent raises in salary don't cover seventy percent raises in rents and mortgages, that there's nowhere to park and the neighborhood stores are falling before franchises from Texas and Europe, and that the fabled skyline grows like Manhattan West--they shall also be used and discarded. Across the board, there is no sanctuary. 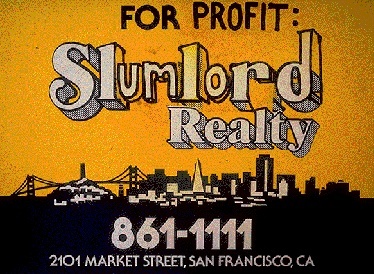 At every stop, a slumlord, gentrifier or developer waits. And between these lurk a network of privilege, utility and influence containing financial, legal and procedural entities of both the low (managers, evictors, scavengers) and high (insurers, banks and shadow financiers). As the victors wolf down banks, developments and governments, the victims tumble through safety nets to the terror of Cardboard City, to the Mediterranean and Baltic Avenues of Mephistopoly. Let us join them in this journey from the slumlord's hovels to the halls of high finance and politics.